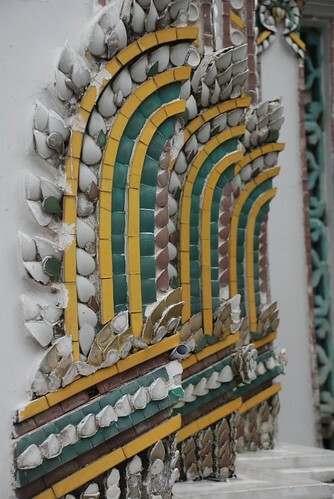 I always go to my favorite Cafe Nang for coffee after lunch or sometimes after breakfast with my good friends. Last week, I saw a woman carrying her baskets past the shop. 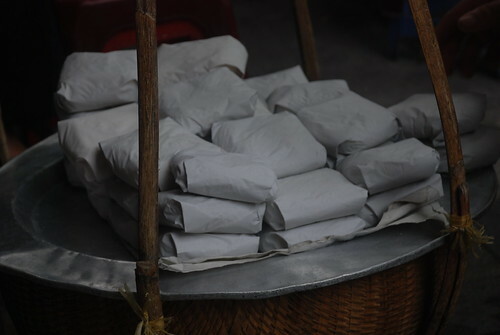 Some women inside the cafe called her in and bought some small packages wrapped in paper. I wondered what was inside the paper. 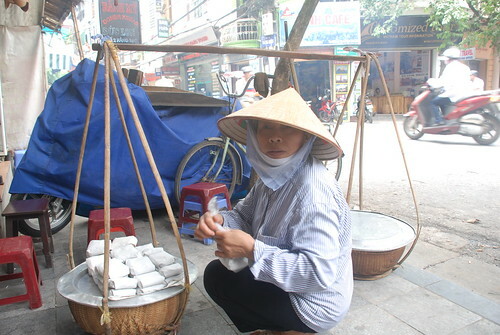 The owner of the Cafe Nang told me it was called Com Nam Muoi Vung / Steamed Rice with salt and sesame. I've actually eaten these before but most of the time my friends put them on plates and also my mother used to put them into a bowl for me to take to school. 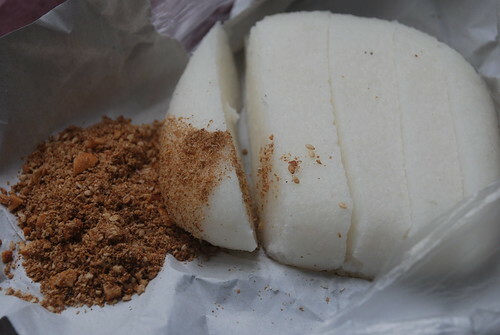 I love this rice cake very much and I ate them all in one go. The lady in the shop told me that this dish was eaten by poor people in the past and that it's also a popular snack to pack on day trips to pagodas in the countryside. I'll definitely be up for another serve at only 4000 dong/serve. 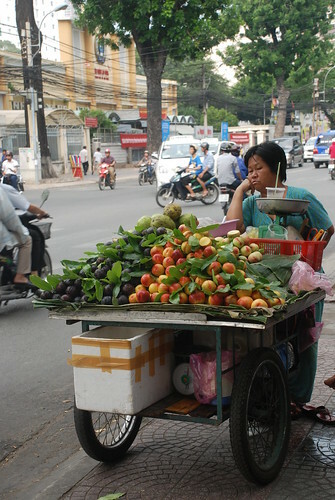 I'm in Saigon for a few days before taking some members of my family to Bangkok for a short vacation. 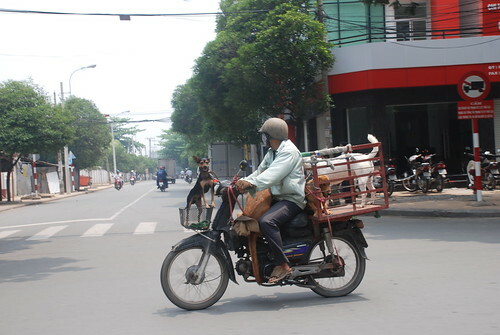 The weather in Saigon is a bit different to Hanoi but I like Saigon as it always cool from 4pm which is much better. At the moment it's rainy season which helps keep temperatures down a bit. Yesterday, when I wandering around the market in the afternnon when I realised my Iphone had gone. I'm very upset with myself for not being more careful with my bag. Normally in Hanoi I know exactly what's going an around me and where my phone is. I just lost concentration for a second and it was gone! I'm trying not to let this incident ruin my holiday but it's hard. After trying to call the phone a few times I gave up and went back to the hotel. 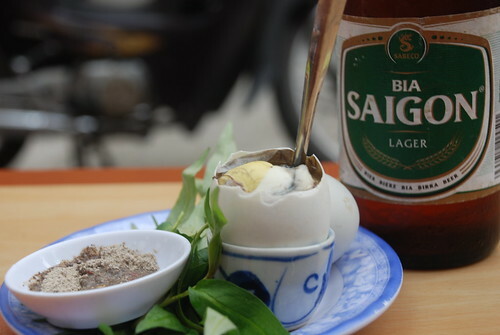 Later in the evening I went out for some snacks, including duck eggs and crabs with tamarind sauce. This made me feel better but I'm still thinking about the phone. 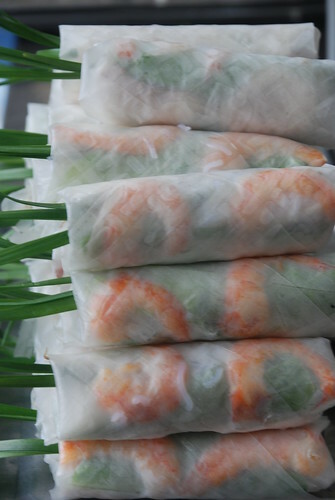 I was trying to take few photos of the food but I couldn't get them in focus, which I hate. There must have been something wrong with me at the time. I decided to walk back to the hotel for an early night. The next day I returned and had more success taking photos of the food. I really love eating from this old lady who has quite a striking face. She is quite a character, smoking, swearing and laughing with all of her customers. She rocks everybody who comes to her stall. 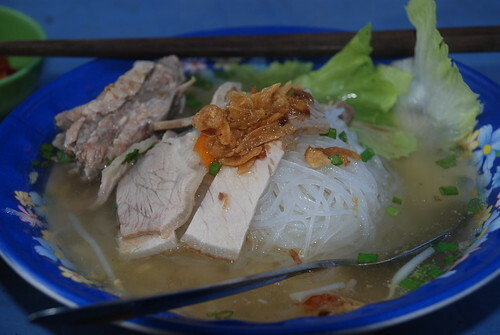 I also went to my favorite Hu Tiu vendor for breakfast. It was great to see she remembered me and what I normally order as extras such as fresh beanshoots, a bit more dried onion... The only thing that she doesn't know is that I don't eat lots of meat and noodles now because I am trying to loose some weight and workout on my belly. Anyway, I went back to her shop for every breakfast and the day I left early for Bangkok, I got up extra early for another serve of noodles. A smile and a wave from her was a great start to my trip. 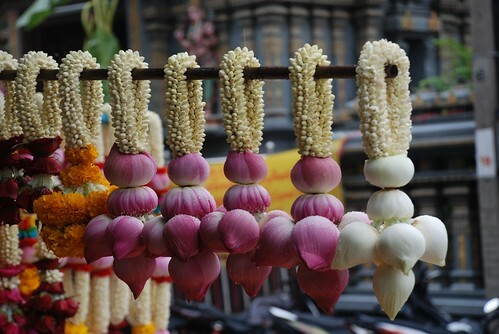 I have been to Bangkok quite a few times and even though it's actually an interesting city, it's not my favourite destination. I'm going back to Bangkok this time to take my mother and sisters for a short trip to fullfill my promise to take my mother to one country in southeast every year. My sister and I took her to Malaysia and Singapore 2 years ago and she loved it very much. I hope the Thai drama is over as my family are a bit worried and I had to spend hours trying to convince them that is was safe. One of my friends told me, as a joke I think, that we should take some red shirts which may help if the trouble starts again :). Anyway, I hope Mum enjoys our trip to Bangkok. 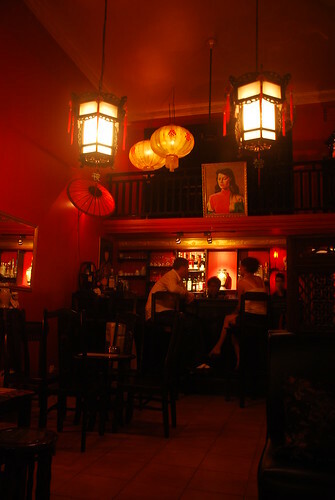 In the last trip to Siem Reap, following the hotel staff's recommendation, we went to Miss Wong cocktail bar for a drink after dinner. I was quite impressed about this Chinese - Shanghai old style bar which is inspired by the owner's impression of Miss Wong from China. 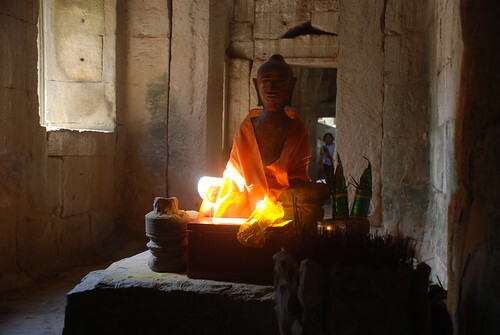 It's totally different compared to the rest of the bars in Siem Reap which were all modern and a bit tasteless. 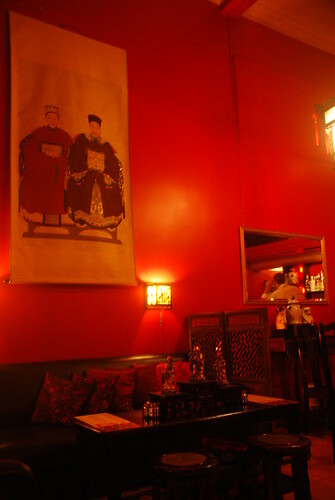 Miss Wong is lit with low red lights, chinese style tables and chairs and interesting photos. I do love their menus designed sharplywith Miss Wong photos on the top. 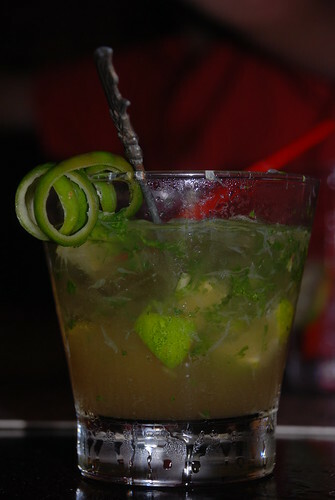 They make very nice cocktails particularly the Mojito and Margarita. 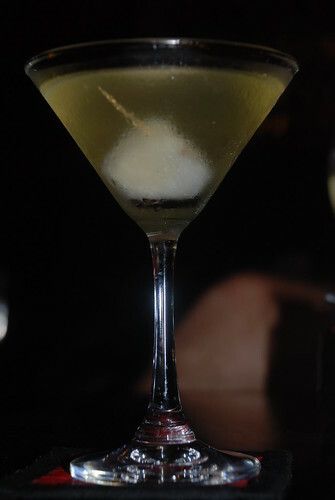 I also enjoyed the China white cocktail very much and I think the staff have been trained very well. They speak quite good english and they are very friendly. Anyway, good to know another place in a small town to hang out next time and have some of the best cocktails in town. 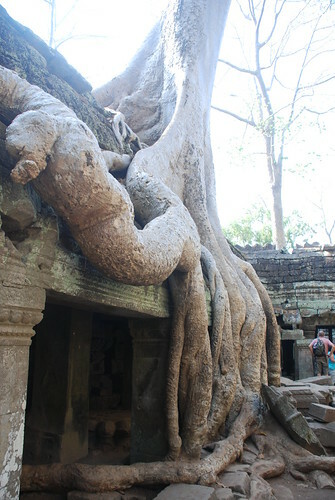 Siem Reap is the northern city home to the Great Angkor Wat Temple, the most popular destination for tourists in Cambodia. 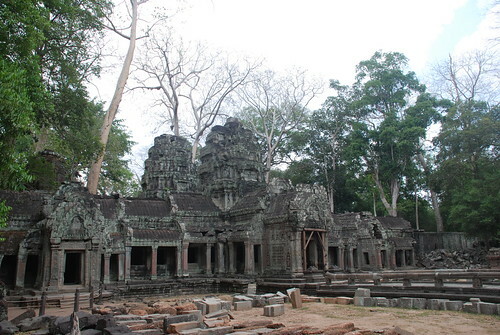 People usually know about Angkor Wat and Angkor Thom which are the well known temples rather than the many smaller gorgeous temples around the area. 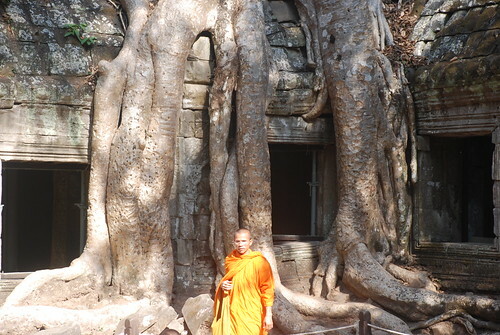 I was particularly impressed by the temple called Ta Prohm or Tree - Strangled Temple. 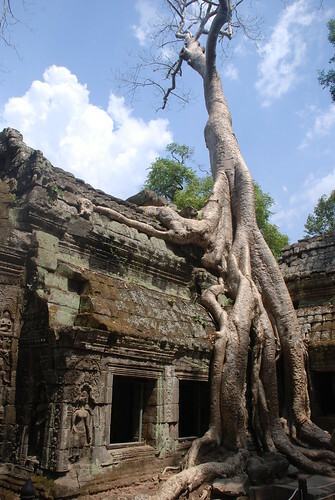 This temple is 800 years old and has lots of enormous beautiful trees, a great example of nature and manmade structure as one. 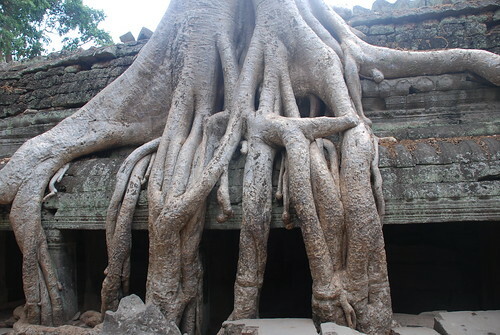 The tree roots twisting around and on top of these temples look like the tentacles of a giant sleeping octopus. This unique appearance of the temple attracts thousands of tourists every year even though the weather isn't that pleasant throughout the year, averaging 34 degrees. 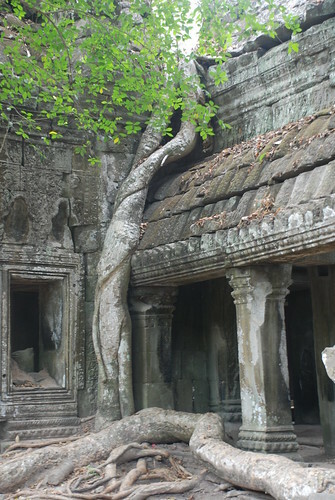 Interesingly, Tom Raider, the 2001 film starring Angelina Jolie helped to spread the world about this amazing feat of architecture. 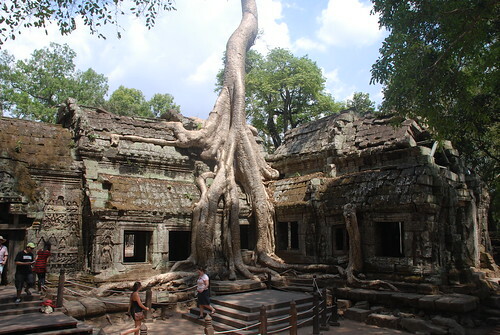 About a hundred meters walk from the beautiful entrance you can see the first temple with a large front quadrangle surrounded by several tall trees reaching to the sky. 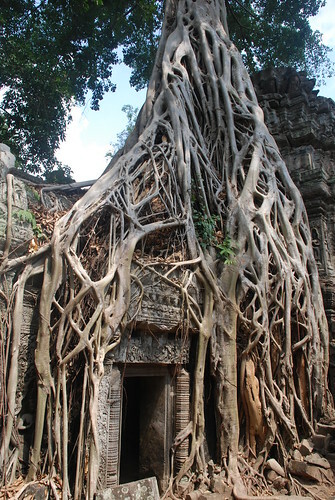 Walking through this temple complex is exciting, with trees and roots blending into the temples at every turn. It's like an enormous sculpture. The camera was working overtime!